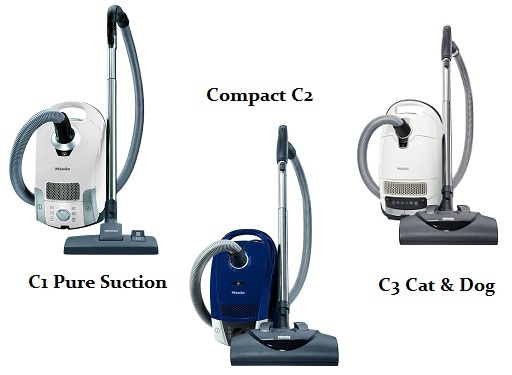 Miele C1 Vs C2 Vs C3 – Which Vacuum Is Best For Your Home? Miele is known for building high quality vacuum cleaners that typically last 20 years or more. Their lineup consists of uprights, lightweight stick vacuums, and even robot models that can clean on a pre-determined schedule. However, there is no doubt that the Miele canister is what really started it all for the company. They have many different models to choose from, each with unique qualities that set it apart from the rest. So how do you know which one is best for your home? Hopefully this comparison will clear up and answer any questions you may have. While there are some big differences between the C1, C2, and C3 canister vacuums they do share some things in common. All of their canisters come with what they call their ‘Compact System’. This space saving design fits the hose neatly on one side with the wand and head on the other so you can store it in small spaces when not in use. One touch automatic electric cable rewind also keeps the long cord out of your way, without the hassle of manually winding it up. Another great improvement they have added to their entire canister lineup is their ‘Comfort Handle’. This handle is ergonomically designed to keep the pressure off your wrist during long vacuuming sessions. The fingertip electronic controls let you quickly adjust the settings without removing your hand from the machine. A high performance LED light is built into the front to completely light up the carpet or hardwood in front of the floorhead. Let’s take a look at the main features of each model and breakdown what types of cleaning jobs each is really designed to do. The C3 Complete models are recommended for all types of flooring. If you have medium to high pile carpets it is recommended to buy one with their powered Electrobrush as the brushes work just like a full sized upright. It is quite light as well, weighing in at around 16 pounds with the on-board accessories installed. HEPA filtration is standard which is a must for those households with family members who suffer from asthma or allergies. Click here to visit our recommended supplier for current pricing and shipping options. As the name of the C2 Complete states, it is designed primarily for hard floors but it can handle some lower pile carpets as well. The SBB300-3 Parquet brush is a great attachment in that it will go flat under furniture or right up against kick jams and chair legs. It will twist in 90 degrees to make sure any dust bunnies do not roll away. There really aren’t any better canister vacuum cleaners in their robust lineup that can handle smooth floors than this model. Click here to read consumer reviews and check current shipping options. The Compact C2 is really designed for all types of floors. If you have thick or high piled carpets just be sure to get a model with their Electro+ attachment so you can pull embedded dirt from any carpeting. Canister vacuums are perfect for a variety of floors as they are easy to move, easy to change attachments, and powerful enough for all rugs. For more information including current price levels and lists of options, click here to visit our recommended online store. Depending on the configuration and tools you select, the Classic C1 can be used on all floor types as well. It is nimble and the caster wheels move it in every direction with ease. It is also very quiet, usually under 80 decibels even at full power. This is surprising given how much ability this vacuum really has. Click here to compare the various models in their lineup with pricing, and to read consumer reviews for more detailed information.